Asssorted Hip Hop Jewelry given out to your guests by our attendant from our "Bling Station". We provide assorted Chains, Pendants, Grillz, Watches, Bracelets, Rings, Hats, Glasses, Charms, and more! Optional L.E.D. Belt Buckles available! Cocktail Hour Entertainment provides the best in entertainment services for the cocktail hour at your Bar Mitzvah, Bat Mitzvah, or other Special Event. Our services are available for just 1 hour or for the entire party. 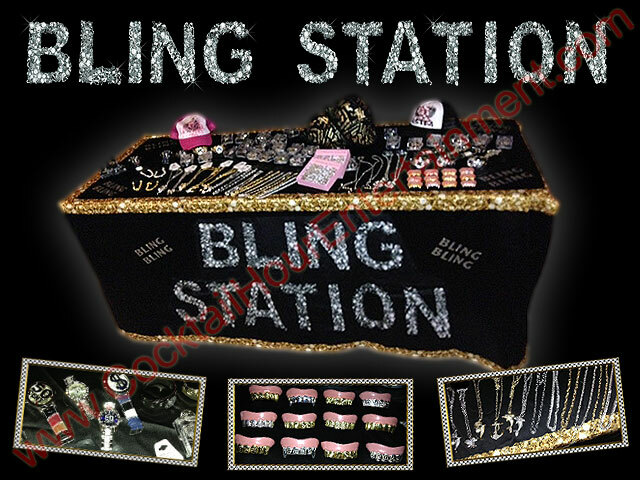 We provide Casino Tables, Slot Machines, Photo Favors (Photo Novelties), Engraved Dog Tags & Keychains, Caricaturists, Balloon Artists, Strolling Magicians, AirBrush Tattoo Artists, AirBrush Party Favors (AirBrush Shirts, AirBrush Pillows, AirBrush Boxers, AirBrush Hats, etc....), 8 Player Video Game Systems, Dance Dance Revolution, Rock Band, Guitar Hero, Slotless Car Racing Systems (Microreality), Basketball Pop-A-Shot, Football Pass, Air Hockey Tables, Air Dome Hockey, Jeopardy Game System, Giant Twister, Giant Connect Four, Giant Jenga, Wurlitzer style Jukeboxes, Rice Jewelry, Carnival Games, Speed Baseball Pitch with radar Gun, Hermit Crab Races, Money Machines, Big Foot Race, Sumo Suits, Surfboard Simulator, Kid Vid (make your own Music Videos), DanceHeads,Velcro Wall, Skill Cranes, Pucker Powder (Sandy Candy), Dippin Dots, Coldstone Creamery, Cotton Candy Machines, Popcorn Machines, Hot Dog Carts, Soft pretzels, Sno Kones (Snow Cones), Candy Zone, and more fun party options!